Funny, well-paced gag comedy, that suffers slightly from subpar animation. TL;DR Version: Well-paced gag series that overcomes some animation issues, but will not convert anyone who doesn't like the short form anime of 2-5 minutes. The 2-5 minute length shows coming out of anime over the last couple of years have run a spectrum on genres, but almost always pull off a tight, well done show with the limited time they have, which is usually slotted between two longer shows, or simply released online. While not for everyone, I feel that these shorts are helping to keep alive a long history of short animation, which, if you look at the history of the medium, have been some of the best examples of what animation is capable of. While none of these are the epic shorts from Disney in the 30s and 40s, or Warner Brothers in the 40s and 50s, they have their own charm, and they are often executed well enough to tell a complete story in a very short period of time over the course of a season. Enter Nora, Princess, and Stray Cat, a short anime series based off of a PS Vita visual novel of the same name. Normally, that should worry you. Shows based off of visual novels are a crap shoot. Many visual novels clock in at over fifty hours, and a full season of full length anime only comes in at 5.5 hours. To condense a visual novel to, at most, 46 minutes, means this could be anything. Please allow me to ease your worries as Nora, Princess, and Stray Cat is a tightly focused gag manga, that is charming and legit funny, and more than worth your three and a half minute investment. 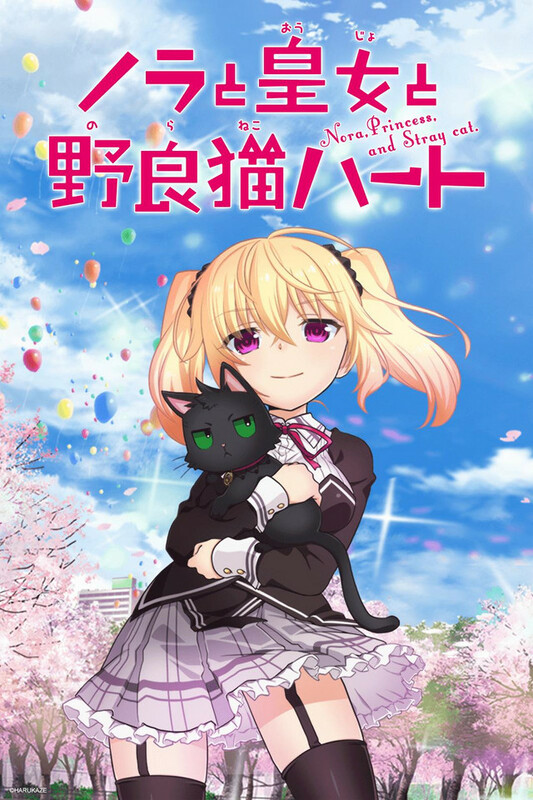 Nora, a normal boy has been turned into a cat by the Princess of the Underworld, and there are three other cute girls who have some interest in Nora. Nora can only be turned back by a kiss from a girl, and the first episode shows how difficult that can be when the motives of the girls clash. The joke around the kiss goes to it's most absurd conclusion as the cast watches the results, and if you can keep up reading the subtitles as you are watching, you're gonna laugh. The character designs are cute-ish, depending on which version they are in. The normal designs are nice and crisp, but I do not enjoy the chibi/SD designs as they look a little rough, which makes sense because this show was done very quickly after being announced in May. The real problem with the apparent rush to production is that some of the animation is really unfinished in this first episode. The opening animation is of particular note as there is a lot of "limited animation" in a sequence that should be the best animated sequence of the series because it will be reused in each episode. This is the only real disappointment of the series. The voice acting and the writing are the stars here, and the series soars as the jokes land perfectly, and even if some of the jokes are played out tropes, they are executed well and lead to a lot of pretty decent laughs. The show does not take itself seriously in any way, and in someways, it's a Teekyu light - absurd, fast paced humor that is not hyper-speed. If you are not already sold on the short-form series, this won't do anything to change your mind. But, if you give it a chance, Nora, Princess, and Stray Cat is a charming, funny, absurd short anime with well timed jokes that twist anime tropes that you are already familiar with. A complete mess, but not a total disaster. I hesitate to blame the art style due to possible budget restraints, but that being said, I have seen better animated series on youtube, or even in some old crappy new grounds stuff.The Character's are somewhat one note, if that, and the fan-service falls flat in that everything is pretty ugly. The saving grace is that due to each episode being so short, it doesn't give you too much time to get completely bored, and while the jokes are hit and miss, there are a few good jokes from time to time. I feel like the concept while not original, could make for a pretty entertaining show given good source material, or just a well realized and executed studio vision. If you are watching this and want something worlds better, I recommend 'I can't understand what my husband is saying', which is far funnier, more relate able, and better animated, both seasons are available here on crunchy roll so what are you doing? Get to it. this is the only anime ive ever seen in which i watch the intro every single time. the reason being that if i dont, i get about 3-4 minutes of the actual anime only. i seriously feel like this anime could be so much more interesting, and maybe even good if it wasn't so short. the idea is interesting, and the characters are funny. the only problem is that because its so short, and the writers/producers of it decided to just skimp out on a story entirely, every 4 minutes of it a week is just about one little event. it totally lacks and kind of keeping power over people. why should i keep with an anime, no matter how good it is, when out of an ENTIRE WEEK i get a maximum of 4 minutes of entertainment from it? even writing a review is hard because of how short it is. what am i going to talk about? ive seen a total of 12 minutes from all 3 episodes. Characters come and go, the only explanation to the circumstance around the cat is from the description, and i dont know a single characters name or their relationship to the cat. Its disappointing because as i said if this was a full length anime.... i feel like it could be interesting and possibly even a good one. Truly disappointing that its not. Frankly, this is a waste of time to watch. No underlying theme, excessive intro/close for length of anime, animation/skits leave you feel cheated..especially episode 6. the only reason it didn't get a 1, is that I reserve that rating for shows that should be avoided due to content. If you want to watch a comedic nonsensical short I would suggest teekyu which delivers a lot more in the same length of time. Something with a little historical information.. ninja girl and samarai master..
All of which are presently available on Crunchyroll. Like i said this Anime is very funny, But only 3 mins long for each episode you don't get much to watch, plus you have to wait for Wednesday to see it. But all and all it's a good anime, and it has no company to help it out. So give it a try why don't you? What you would watch on public transportation. Basically its an anime you suspect was made to be shown on a Bus or train tv screen for 3 minutes travel in the city. That's about as much mileage as its worth. Not much notice, easy to understand, nor really interesting to keep you interested. But also not very long so not painful either. I love short shows, but this one was especially bad. I just don't care about the rest of it. I have nothing against 3 to 5 minute long videos. Fantastic things can be created and told with such little allocated time if paced right over a long series of those short episodes. I see it happen all the time! Sadly the reason this series is losing points with me is because I would of liked to see Nora as a human meeting Patricia and the events which lead up to him being turned into a cat. I would of liked to see more episodes push the story along then some of the complete random gibberish they had. I had to find out a lot about the characters and their backstories via google. What was it that I just watched? Cute, random and silly this series is not there to make a complex story or character development. It start, make a couple of jokes and leave. The animation is rough, but colorful giving every second of the anime a lively appearance matching the speedy jokes it try to share. A cute little anime that is fun if you want a laugh.